Savas improvements, holosight progress, and new update frequency. 9/9 @ 3:48pm EST - Not a ton to report on today, most commits have been Andre and Diogo tackling a bunch of Unity 5.2.0f3 changes. Garry is still working on the mods, Helk merged main with tralala again. Expect more tomorrow (remember: no update this week). Last week, Garry added a poll in the devblog to gauge how often people wanted updates. As we discussed yesterday, ‘weekly updates’ came in first, followed by ‘every 2 weeks’ in a close second. Shortly after I posted that article, Garry officially announced there would be no update this week and they are trying out a new 2 week schedule. That means the next update is scheduled for Thursday, September 17th. A part of me still craves the weekly updates, however, if this produces higher quality and more reliable updates, I’m all for it! Petur has released a bunch of improvements for the new, symmetrical island of Savas. Unfortunately, the state of Savas is a bit wonky right now. People on the main branch can still see and join servers running Savas, however, they won’t find any loot unless they are opted into the development branch. Therefore, if you do want to try out the changes below, make sure you’ve opted your client in! The loot tables have been tweaked so there are no more blueprint fragments and less crappy items. Also, there is a small chance of top tier items on beach spawns. There is now a small square zone where building is allowed (see rough map below). This should make for some interesting king of the hill gameplay. Complimenting the new build zone, explosive charges now spawn in a hut behind the big sphere monument. Several campfires and a large furnace have been added around the map. This will allow people to cook meat from animals they’ve killed. Also, food items are still spawning around the map. Loot crates have been changed so they are clearly tiered (see below). Yesterday, I discussed the recent changes to the store (many prices increased and 3 common items were added at $10 a piece). In an interesting turn of events, the number of yellow shirts for sale has plummeted from over 15,000 to right around 5,000. This is, in part, due to a buying frenzy by Garry, who snatched up a metric fuckton of them early this morning. I just asked Garry if I should start buying up all the yellow longsleeves, too. He shared that he’s doing some experiments with balancing the drops; trying to avoid situations where there are 15,000 items for sale at $0.04. Does this mean you should invest your steam wallet retirement funds in yellow longsleeves? I’m not sure, but I picked up a couple just in case! Yes, it is the exact same model as legacy. 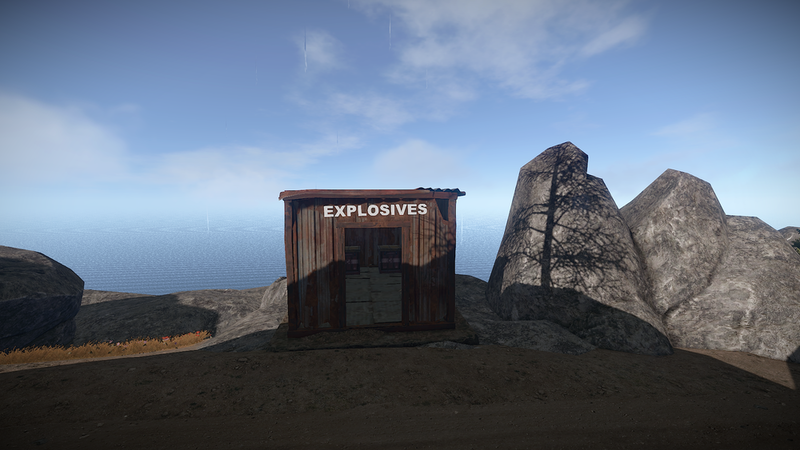 And yes, we can all agree, it looked out of place in legacy and will continue to look out of place in the new Rust. Never fear, I have confirmed this is 100% a placeholder model. A better looking, more Rust-y version will come at some point in the future. In the meantime, I’m just happy to have an alternative to the clunky iron sights of the bolt. The combination options for Rust fashionistas has expanded today as Garry changed it so bandanas can be worn with hats. Neither provide any protection from the elements, so this is all cosmetic. But hey, it’s all about looking good, right?